The Guardian fails to mention that the Cambodia Daily is owned by an American and that the “American NGO” ordered out of Cambodia was the National Democratic Institute (NDI), an organisation notorious for its role in subverting and overthrowing the governments of sovereign nations. The Guardian and other American and European media platforms have collectively failed to dive into Kem Sokha’s background. Had they, charges of treason would seem less far fetched and contrived as they have been presented to the public. 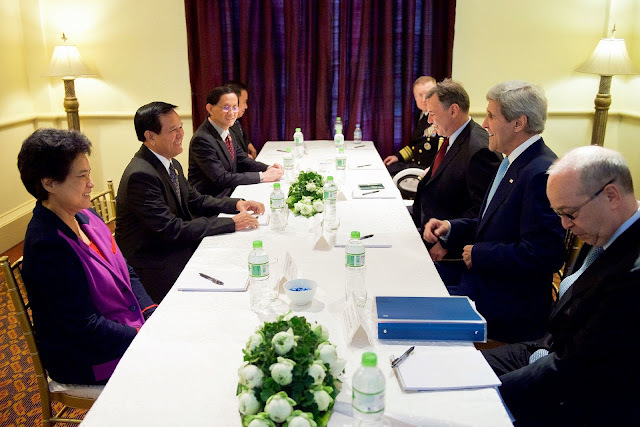 Kem Sokha (third from foreground on left) meets with then US Secretary of State John Kerry. As the US has done elsewhere, it is carefully cultivating Sokha’s political party, assisting it into power to then serve US, not Cambodian interests. 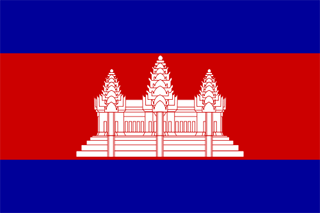 …a leading non-aligned, independent, non-governmental organization that works to promote and protect democracy and respect for human rights – primarily civil and political rights – in Cambodia. We empower civil society to claim its rights and drive change; and through detailed research and analysis we develop innovative policy, and advocate for its implementation. Yet, according to its own financial disclosures, there is nothing “independent” or “non-aligned” about the organisation. On its webpage titled, “Donors and Partners,” it lists the Australian and British embassies, the US State Department, the European Union, USAID, Freedom House and Open Society among many other foreign government-funded and corporate-funded foundations as its financial sponsors. Under “Affiliations and Cooperation,” it lists Human Rights Watch, Amnesty International, Article 19 along with many other primarily US and European-based, organised and funded fronts that leverage human rights advocacy in pursuit of politically-motivated agendas. 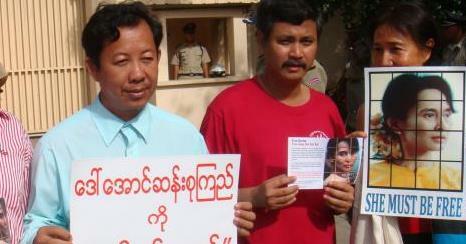 Ironically, on this same page, activists are shown demanding the release of then-imprisoned Myanmar politician Aung San Suu Kyi who has recently run afoul with advocacy groups due to her role in ongoing genocide against that nation’s Rohingya minority. CCHR is clearly not “independent” if it is in fact dependent entirely on US and European cash to operate. Nor is it “non-aligned” if it is clearly aligned unequivocally with US and European-led interference across Southeast Asia through fronts they collectively fund to undermine one government in favour of another. Since taking to politics, Kem Sokha and his opposition party have regularly met with the sponsors of CCHR, including the US Secretary of State John Kerry in 2016. U.S. Secretary of State John Kerry will meet with the CNRP and at least one NGO leader when he visits Phnom Penh next week, in addition to Prime Minister Hun Sen and Foreign Affairs Minister Hor Namhong, as was previously announced. Kem Monovithya, a spokeswoman for the CNRP and the daughter of CNRP Vice President Kem Sokha, said Mr. Sokha planned to meet with Mr. Kerry, although she declined to give further information. The director of the Cambodian Center for Human Rights, Chak Sopheap, also said she would meet with Mr. Kerry in a meeting she described as being facilitated by the U.S. Embassy. “I especially wish to inform Secretary Kerry about civil society’s grave concerns regarding the draft trade union law, the proposed cyber crime law, and the implementation of the LANGO,” Ms. Sopheap wrote in an email, adding that she hoped Mr. Kerry would continue to “apply diplomatic pressure” during the U.S.-Asean summit in California next month. Diplomats meeting with and supporting opposition groups in a host state constitutes clear interference in the host state’s internal political affairs and is beyond the scope of legitimate diplomatic relations. This sort of support provided by the United States in Cambodia has in other nations resulted in the usurpation of governments and even war. Examples include Ukraine, Libya, Syria and Yemen. The nation of Myanmar is also currently led by a political party propelled into power by extensive US and European support provided over a period of decades. In neighbouring Thailand, US support for opposition groups has resulted in a protracted political conflict, recently culminating in the fleeing abroad of ousted ex-prime minister Yingluck Shinawatra. Continued US support for Shinawatra and opposition networks will likely lead to further conflict in the near future. Current Cambodian prime minister, Hun Sen, has repeatedly noted the threat to national security such foreign interference poses. Prime Minister Hun Sen yesterday lauded his own government’s efforts of bringing “peace” to Cambodia without “foreign interference” while calling out the US for destabilising the Middle East, where he said American policy had given rise to destructive “colour revolutions”. “Please look at the Middle East after there was interference by foreigners to create colour revolutions such as in Libya, Syria, Yemen, Egypt and Iraq, where Saddam Hussein was toppled by the US,” the premier said. Considering this, the facts regarding Cambodia’s opposition and its ties to US and European interests, it should come as no surprise that foreign-funded organisations posing as NGOs are being shuttered and opposition leaders openly colluding with foreign interests are being arrested for treason. Cambodia’s style of dealing with what is overt foreign interference lacks subtly, diplomacy and discretion. However, Phnom Penh may calculate that strengthening ties with other nations fighting off foreign interference in the region and its growing political and economic ties with Beijing may be enough to prepare Cambodia for any measures the US and Europe take in retaliation to uprooting their networks. If left unchecked, the millions of dollars in US and European money and assistance provided to Cambodia’s opposition will continue allowing it to build its capacity to manipulate and win elections. While the opposition will cite election victories as the foundation of its growing legitimacy, the fact that these victories come as a result of foreign sponsorship, on behalf of foreign interests, undermines the opposition’s legitimacy entirely. Democracy as a means of self-determination does not exist in a system manipulated by foreign interests. In fact, a process infected by foreign interference is fundamentally undemocratic. Ultimately the goal of undermining and overthrowing the current Cambodian government centres around eliminating another potential regional partner for China and creating another point of either contention or destabilisation along China’s periphery. The US has pursued for decades a policy of encircling and containing China with the hopes of one day undermining and eventually completely overthrowing China’s political order as well. Washington policymakers have repeatedly stated their collective desire to establish and maintain “primacy” in Asia, alluding to the fact that its efforts in nations like Cambodia are merely self-serving, conducted behind the guise of democracy and human rights promotion, not in any manner for such promotion.